Yes, basketball and donkeys don't necessarily go well together, but they will go together at the Second Annual DonkeyBall Fundraiser to support The AED Project - Schoharie County. Set for Friday, March 20th, 7:00 p.m. at the Cobleskill-Richmondville High School gymnasium, tickets for the fun filled event are available at Carpets & Then Some, Fit Coalition, or by contacting organizer Nancy Brumaghim at nan.c.b71@gmail.com. 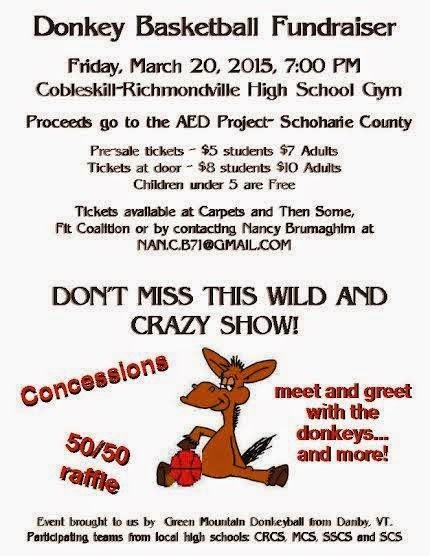 Organized to raise money for the AED Project, which seeks to both inform about and provide portable Automated External Defibrillators to youth leagues in Schoharie County, the event features high school athletes riding donkey back. The event is made possible by Green Mountain Donkeyball from Danby, Vermont; and the participating teams consisting of athletes from Cobleskill-Richmondville, Middleburgh, Sharon Springs, and Schoharie Central Schools. Last year's DonkeyBall debut was attended by over five hundred spectators and raised over $2,000.00 in support of the project's cause to increase local safety and raise awareness of sudden cardiac arrest.